We all have unique ways of doing things. We think, work and respond to all situations differently. The EnterLeadership Selling with DISC Kit is a self-assessment tool that provides an accurate summary of who you are and how you communicate. It will show you how to speak to potential customers in a way that will have your team selling like never before. You’ll also know who to hire and how to develop a stronger sense of team unity. This is a requirement for all of Dave’s team members. You’re about to discover why. Using DISC In Your Business and Death of a Salesman featuring EntreLeadership Podcast host and speaker Chris Hogan. He dives deep into the details of DISC and explains how essential it is to know the personality styles of your team members and customers. 7 DISC Assessment Cards: Each with a unique voucher code to access the DISC Profile System online. Follow the instructions and, in a matter of minutes, you’ll receive a fully customized DISC profile assessment. 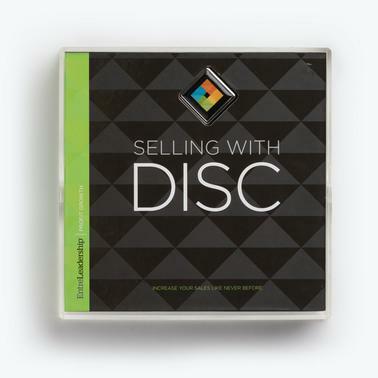 Loaded with two DVD video lessons, two team member worksheets, Selling with DISC reference charts, and the action guide, including the Selling with DISC article and discussion guide – all in digital format. Includes a quick-start guide, two leader worksheets, an in-depth look at the DISC Profile System, the Selling with DISC article, and a discussion guide. These tools will improve communication in your team and help your sales team connect with customers on a deeper level. Allows you to enter the info from your team’s DISC assessments into the online DISC profile builder to create custom DISC profiles for each team member. Your team can display the printed profiles at their work stations. We all have unique strengths and weaknesses. We think, work, and respond differently to challenges. The EntreLeadership DISC Implementation Kit is a self-assessment tool that provides an accurate summary of who you are and how you communicate. It can also help you know who to hire and how to develop a stronger sense of team unity. This is a requirement for all of Dave's team members. The DISC Implementation Kit features the DISC Profiling System, a personal online assessment tool used by millions of people to help them understand their communication styles and improve teamwork. Dave has used DISC within his company for years. This tool helps Dave’s team members understand how they communicate as individuals and how they can best work together as a team. Dave is now providing this valuable tool for teams in every setting, from churches and organizations to businesses and schools--even families and individuals! DISC uses a quadrant graph, placing you somewhere within four distinct personality types.